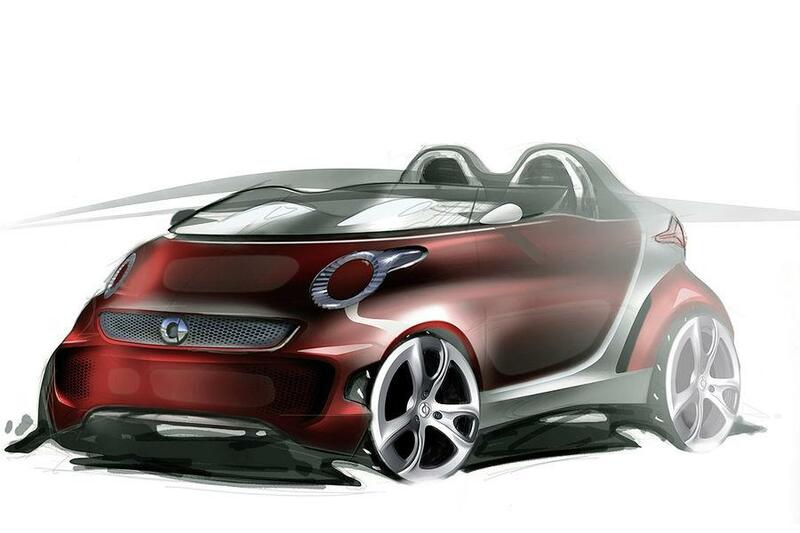 Το Smart Forspeed concept παρουσιάστηκε στη Γενεύη. 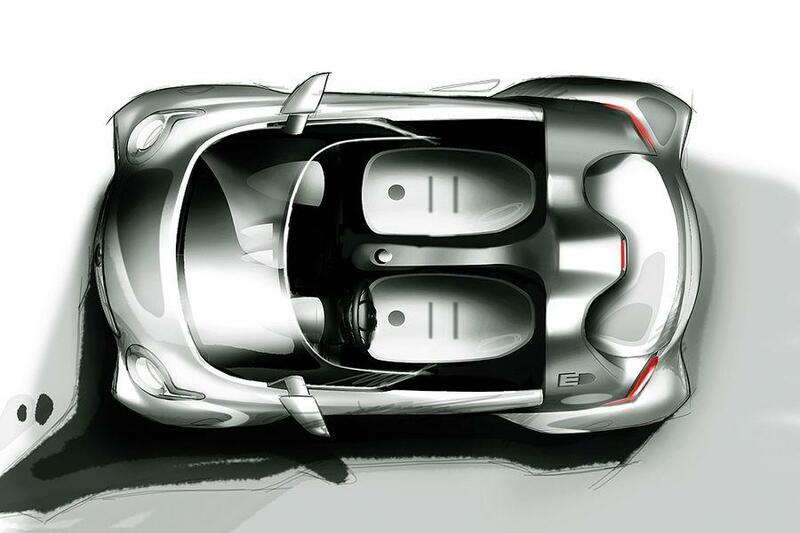 Το ηλεκτρικό roadster πρωτότυπο το οποίο σχεδιαστικά δείχνει το πως θα μοιάζει η επόμενη γενιά του fortwo. 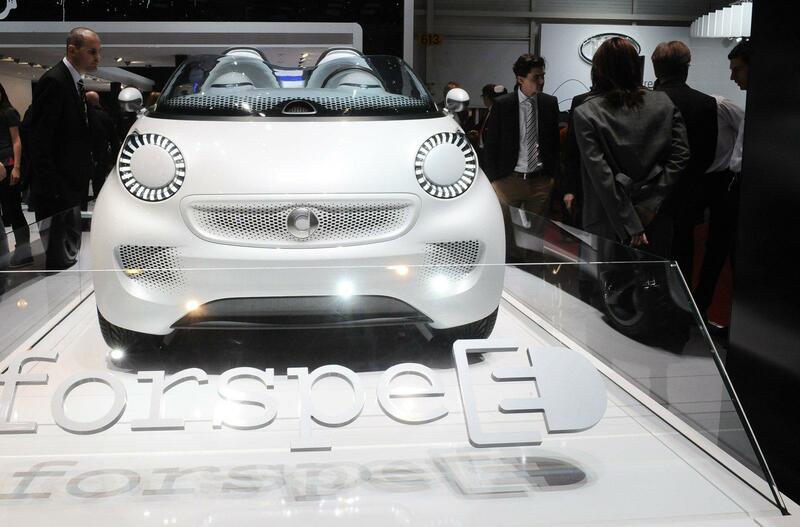 Από μηχανικής πλευράς, το Smart Forspeed concept εφοδιάζεται με έναν ηλεκτροκινητήρα 30 kW (40 ίππων) που έχει τοποθετηθεί στον πίσω άξονα με αυτονομία 135 χλμ. Επιπλέον 7 άλογα μπορούν να παραχθούν με την χρήση του κουμπιού overboost. Η τελική ταχύτητα του ανέρχεται στα 120 χλμ/ώρα και έχει αυτονομία 135 χλμ. Σχεδιαστικά τώρα το αυτοκίνητο έχει κυψελοειδής μάσκα, LED φωτιστικά σώματα, φωτοβολταϊκά πάνελ στην βάση του παρμπρίζ με την υποδοχή φόρτισης να είναι έξυπνα κρυμμένη στο πίσω μέρος, μέσω της οποίας φορτίζουν οι μπαταρίες ιόντων λιθίου. Στο εσωτερικό ξεχωρίζουν τα γυαλιστερά πλαστικά, τα διακοσμητικά αλουμινίου και οι πράσινες δερμάτινες επενδύσεις. 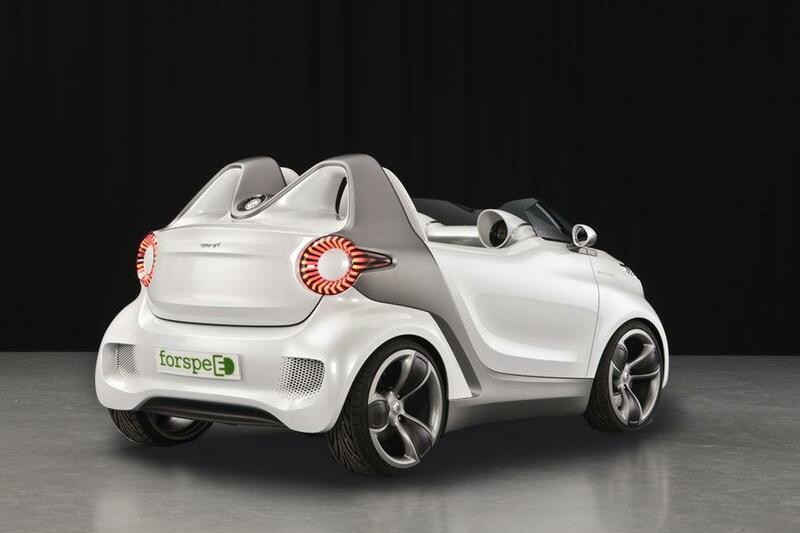 the forspeed combines contemporary urban mobility with the fun factor typical of smart. 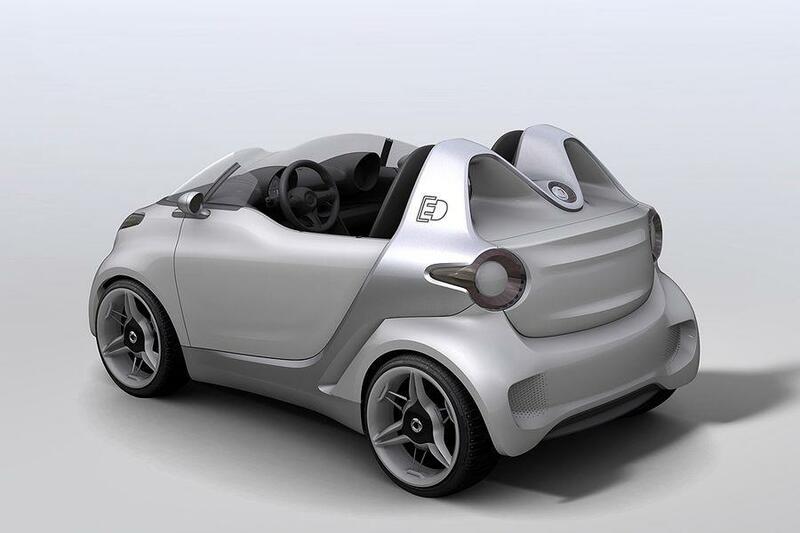 The two-seater has no roof or side windows and it features a low wind deflector instead of a windscreen in the style of a classic propeller aircraft. 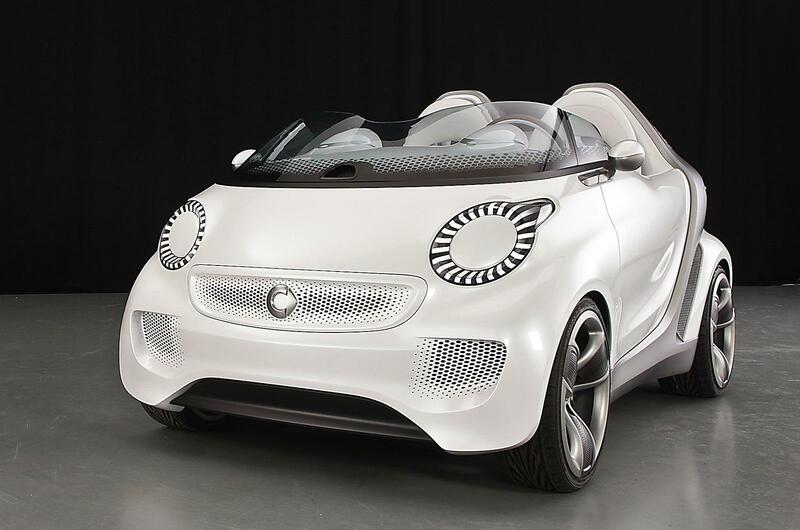 The result is an incomparable fresh air driving experience. 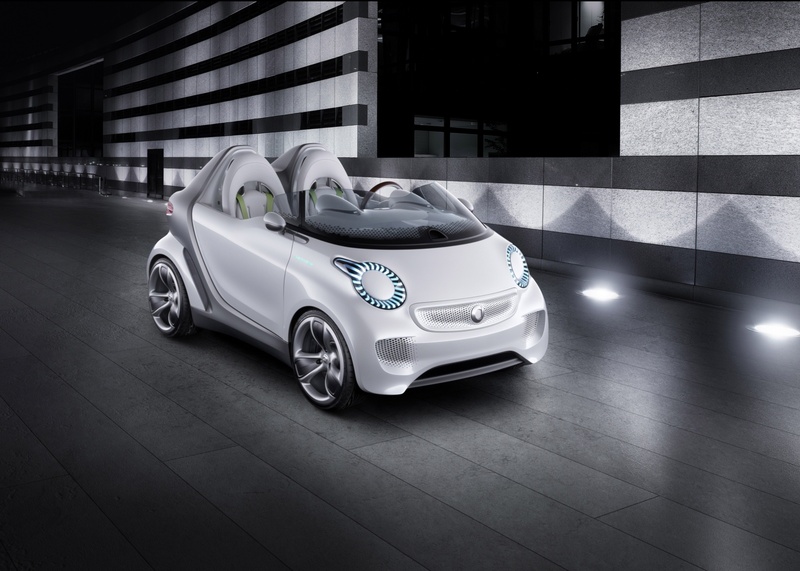 The responsive electric drive that has been further developed and features a boost function also guarantees driving pleasure. 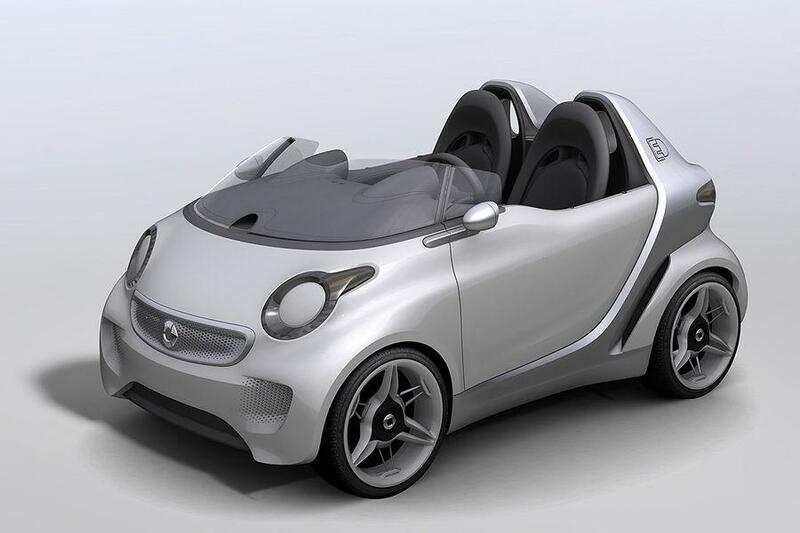 A look forward at the next generation is particularly exciting as the era of electric mobility has already started at smart. 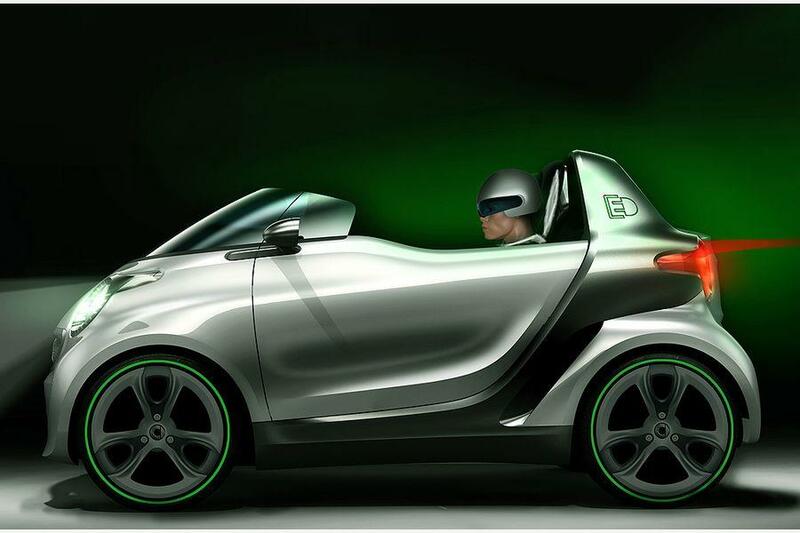 smart is a pioneer in modern electric mobility. 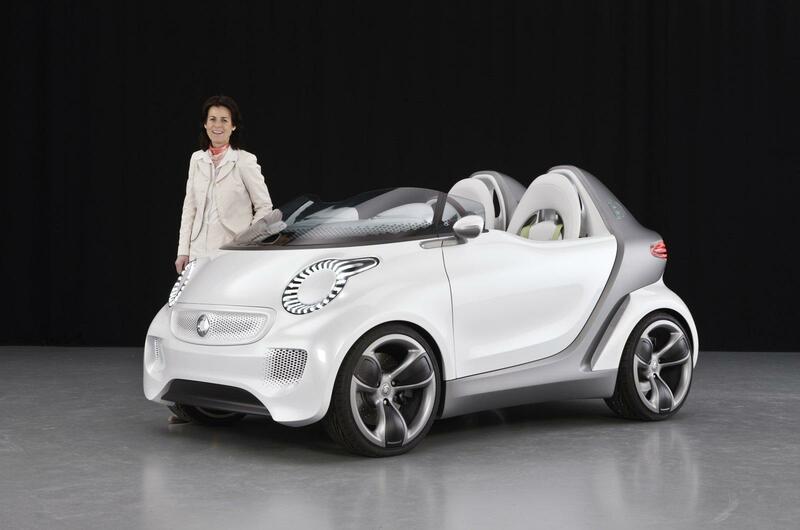 The second generation smart fortwo electric drive has been delivered to customers since the end of 2009. 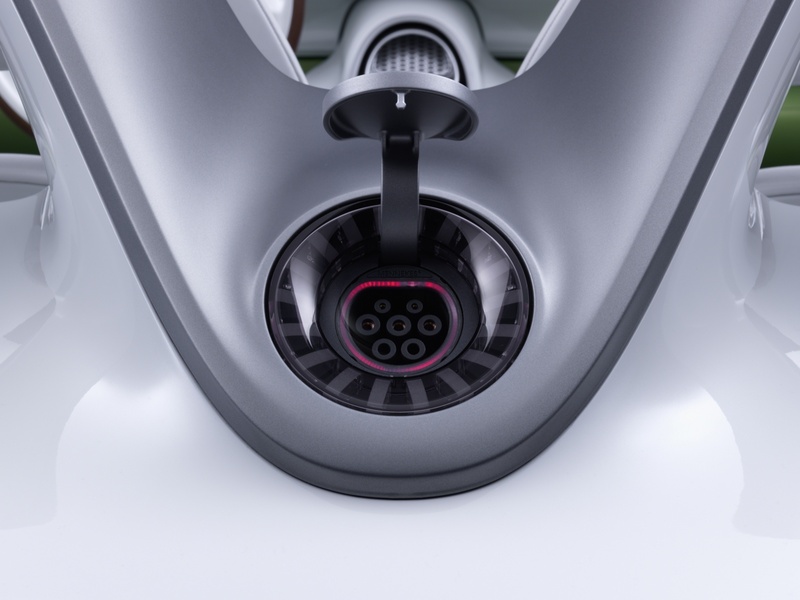 It is been proving its suitability for everyday use in 18 countries including Germany, Italy, Spain, England, France, Switzerland, the USA, Canada and further countries in Asia. 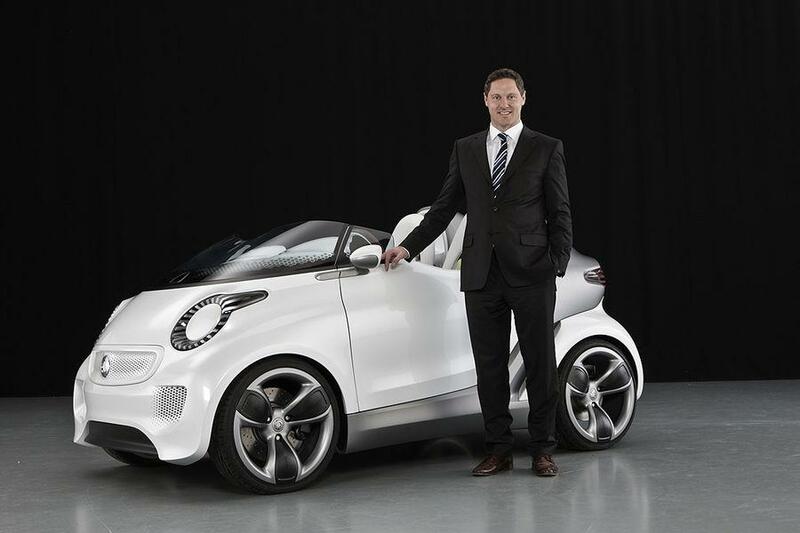 Due to the high demand production figures have been increased to 1500 vehicles. 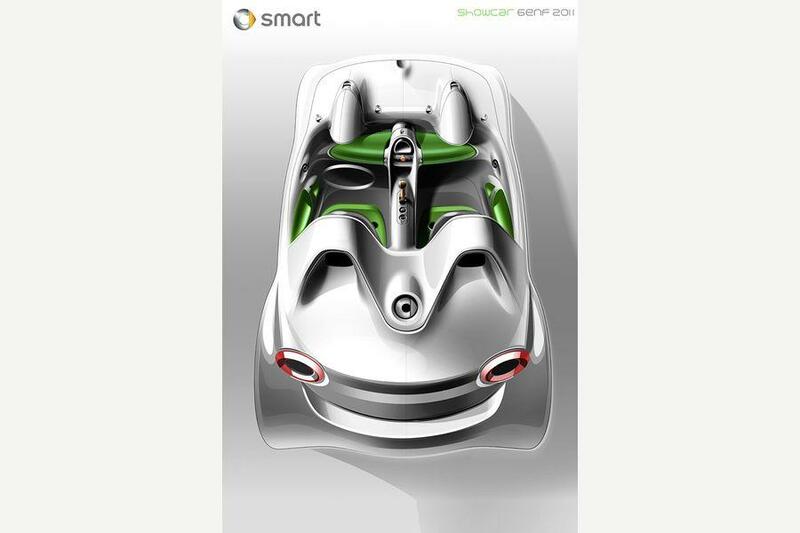 Thanks to this experience smart has already collected extensive customer feedback that has been integrated in the development of the smart forspeed’s electric drive. 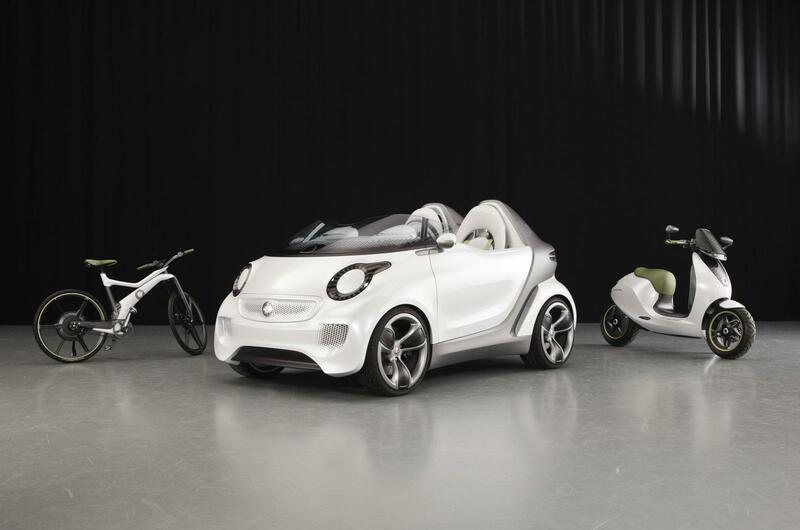 With its improved performance and charge management the concept vehicle offers a look at the performance potential of future generations of the electric smart. 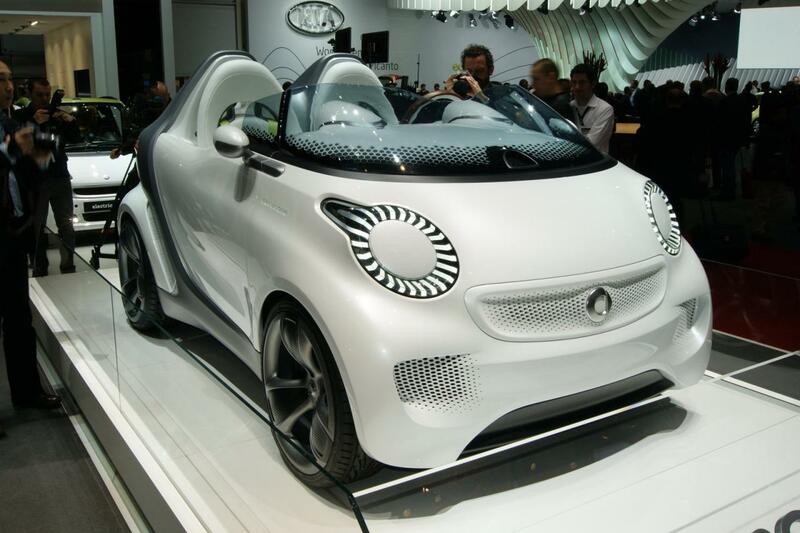 For example, the smart forspeed accelerates from 0 to 60 km/h in just 5.5 seconds and reaches a top speed of 120 km/h. 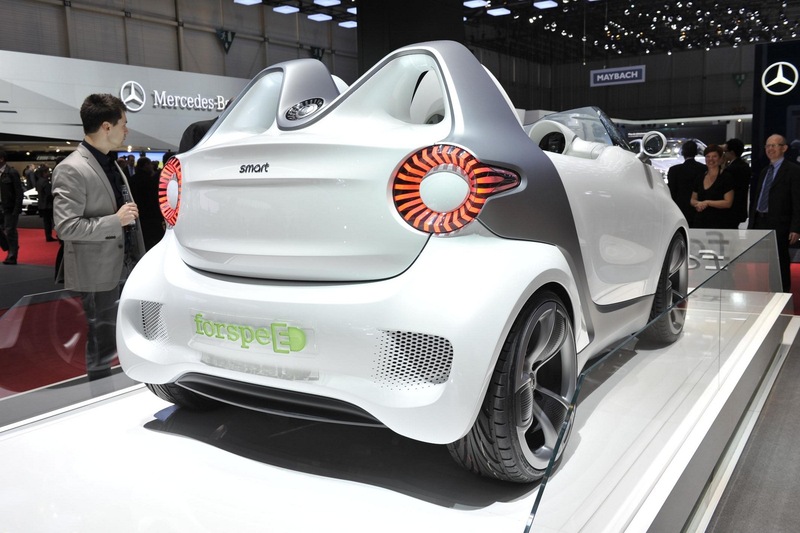 A 30 kW magneto-electric motor is installed at the rear of the smart forspeed and the vehicle concept provides an immediate powerful response from stationary. 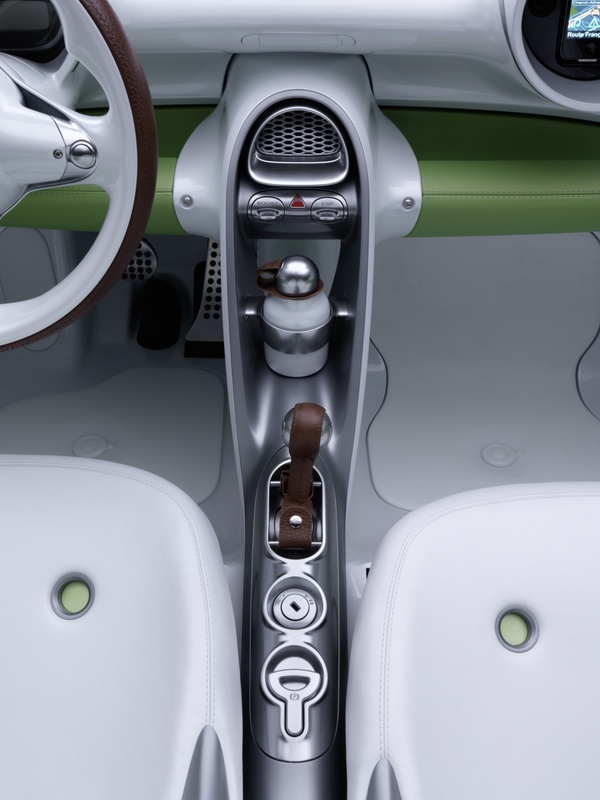 Pressing a button in the centre console activates a boost function which provides an extra 5 kW of power for a short time and is ideal for overtaking manoeuvres on urban highways, for example. 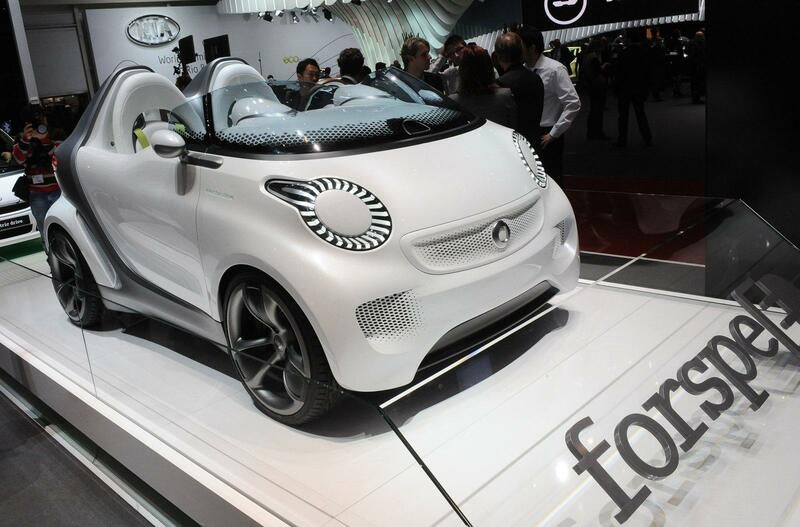 The smart forspeed is powered by a lithium-ion battery that delivers 16.5 kWh of electrical energy. 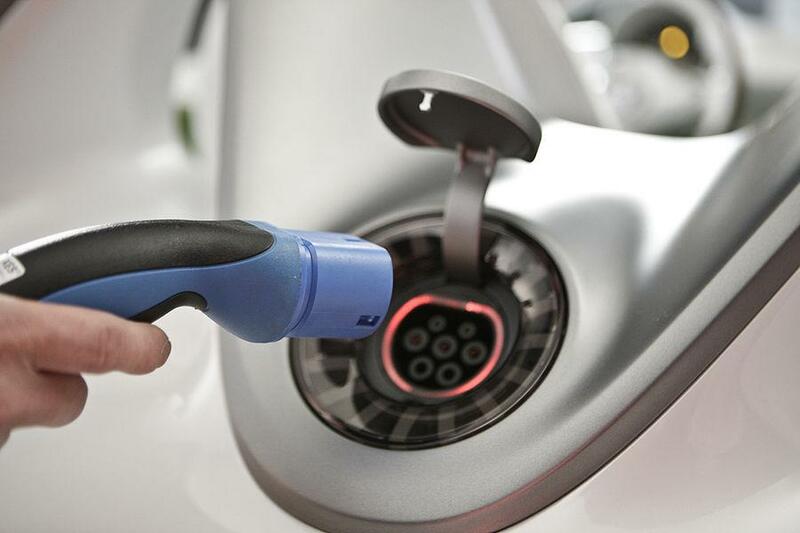 It is simple to charge at any conventional 220 Volt socket. 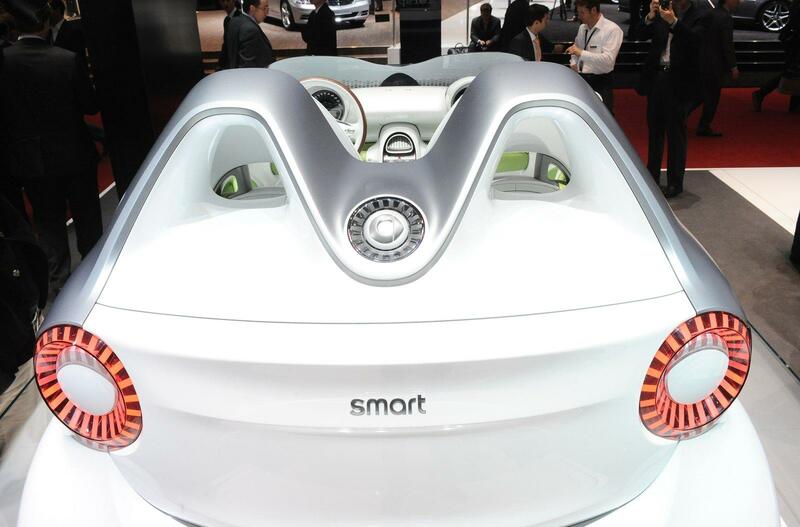 The charging device is located in the third brake light behind the smart logo and features a simple push/push opening mechanism. 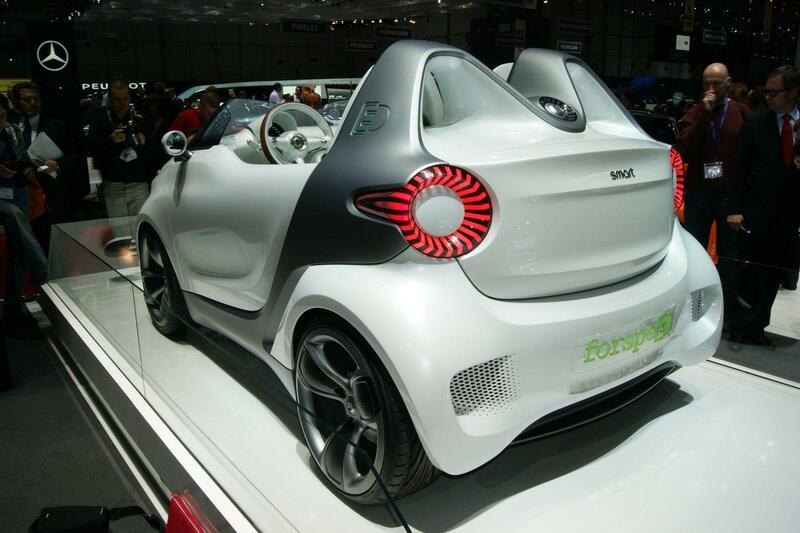 A fully charged battery is sufficient for 135 kilometres of driving fun (NEDC). 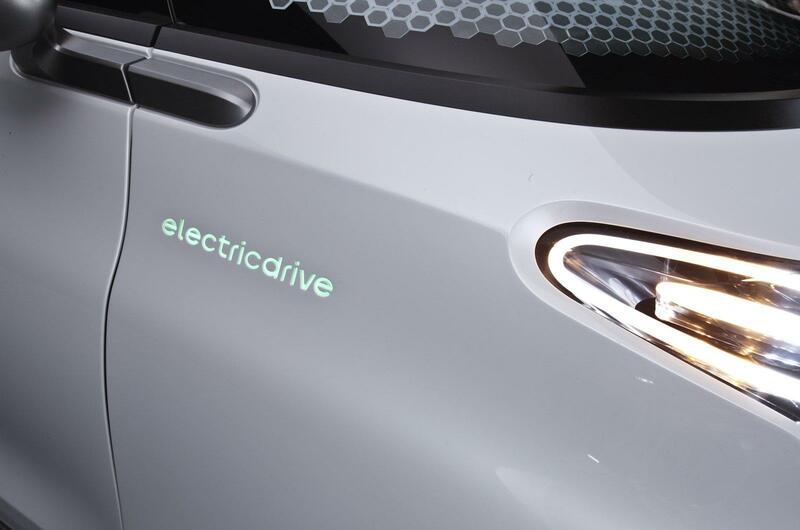 Quick charging from 0 to 80 percent takes just 45 minutes. 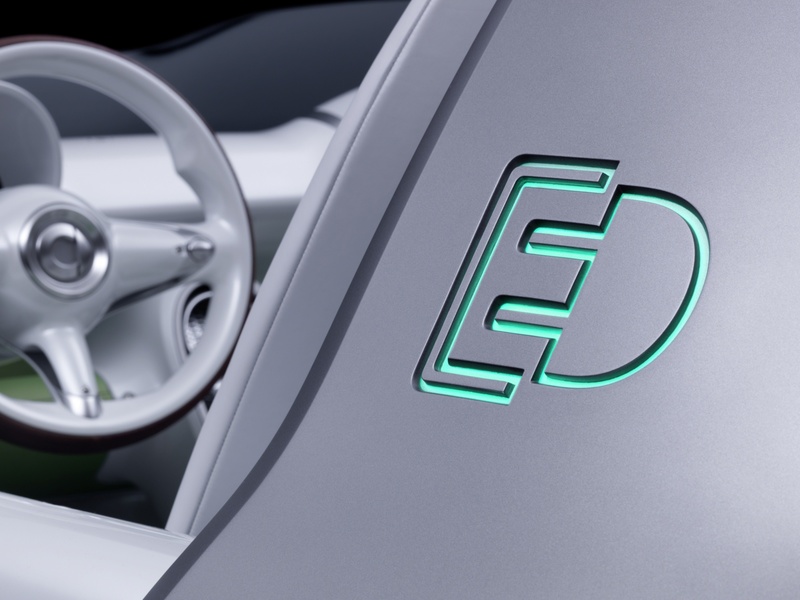 The forspeed developers have integrated a further clever way of charging in the wind deflector: photovoltaic cells feed solar power to the on-board electrical system. 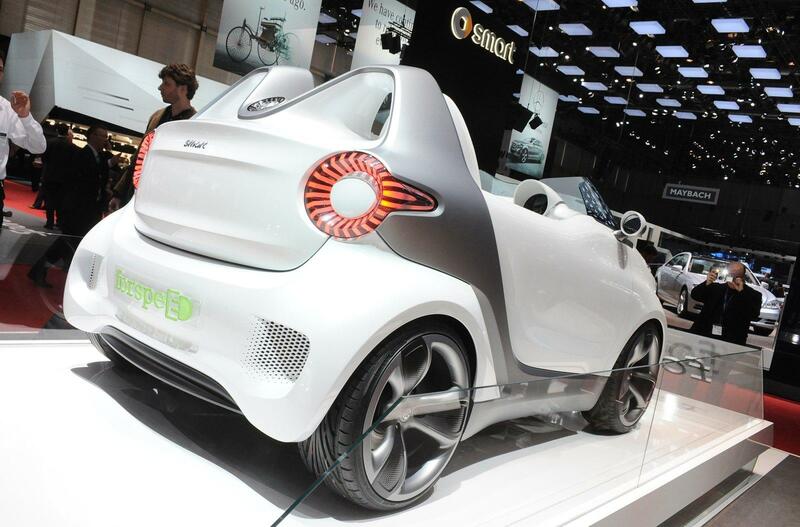 As with the smart escooter this lengthens the battery life of the smartphone, for example. 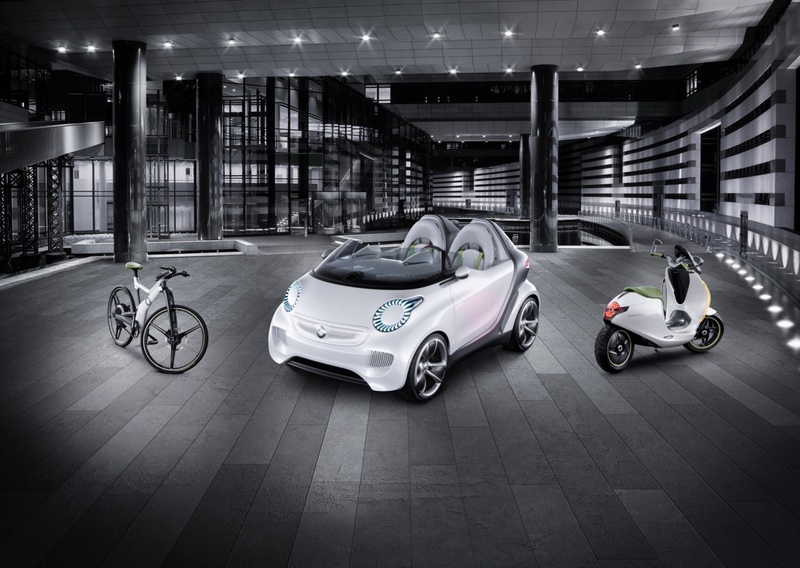 With its high-gloss white metallic paintwork the smart forspeed also builds a bridge to the two-wheel escooter and ebike studies that were presented at the Paris Motor Show. 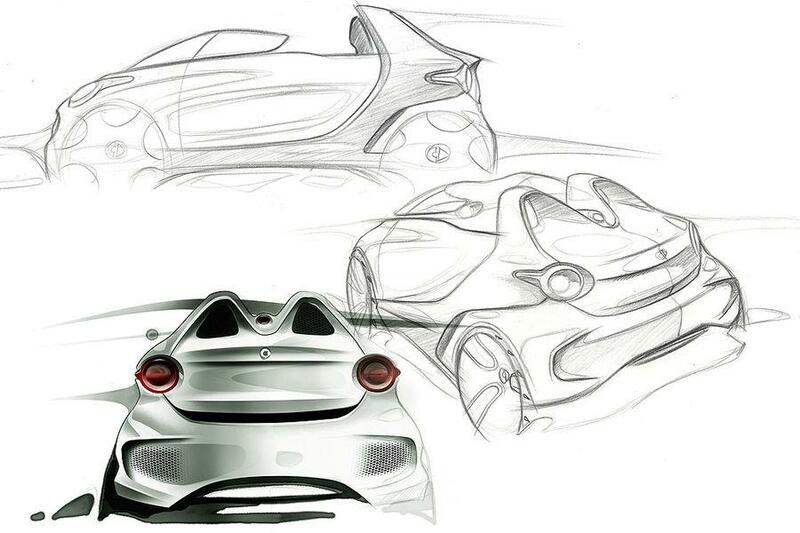 The front and rear lamps have a very striking design. 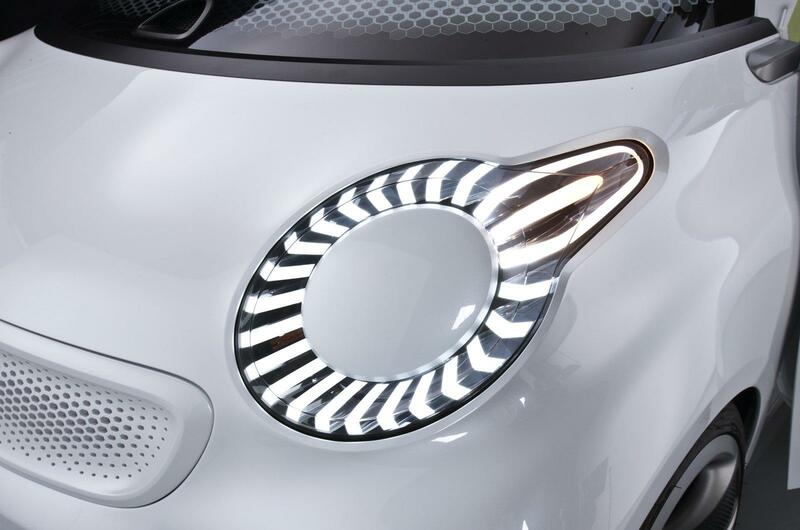 The outer rings are illuminated by a large number of rod-shaped LEDs whilst the centre of the lamps is white. The indicators seem to push outwards like arrows – like drops on the cockpit window of an aeroplane as it takes off. 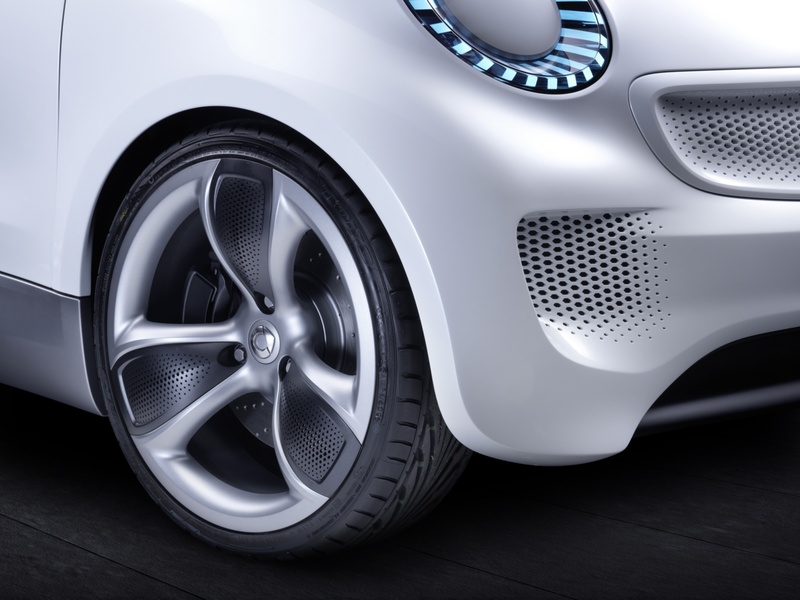 In the front and rear bumpers numerous holes with a honeycomb structure serve as air inlets and create an interesting progressive pattern. 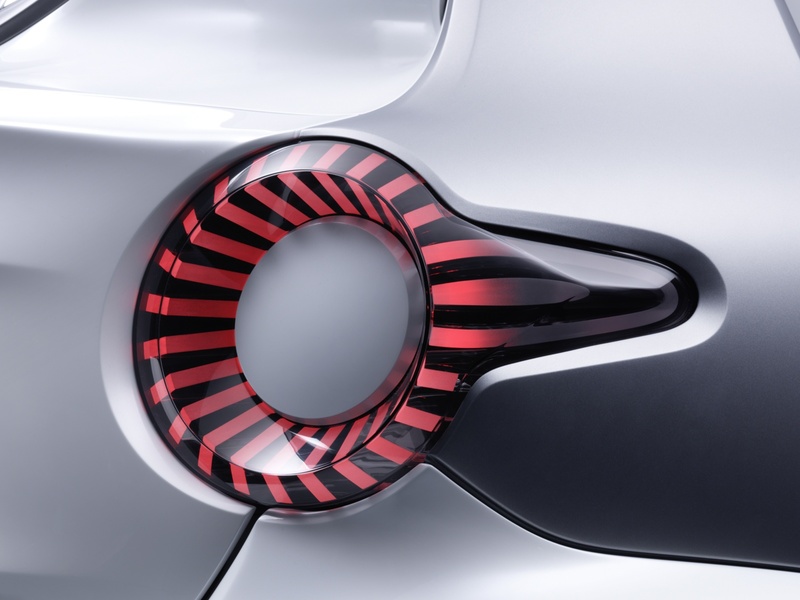 At the same time this pattern gives the forspeed a particularly wide appearance and a powerful road stance. 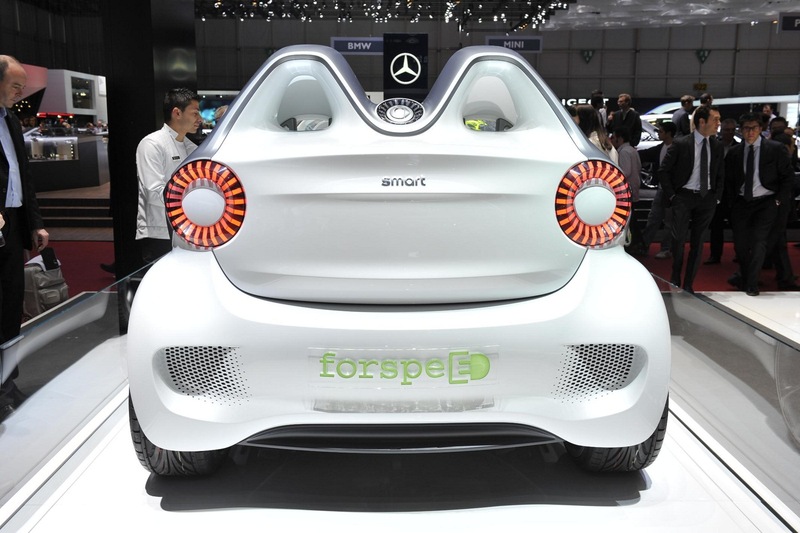 The smart forspeed is fitted with front tyres in size 205/35 R 18 to match its dynamic look. On the driven rear axle the tyres measure 235/30 R 18 for full grip. 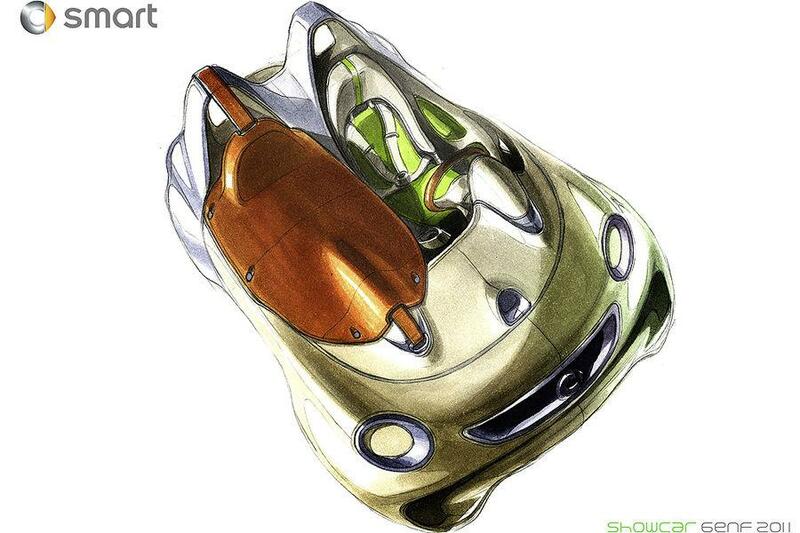 Purist and sporty interior The exterior and interior of the smart forspeed are designed as a formal unit. 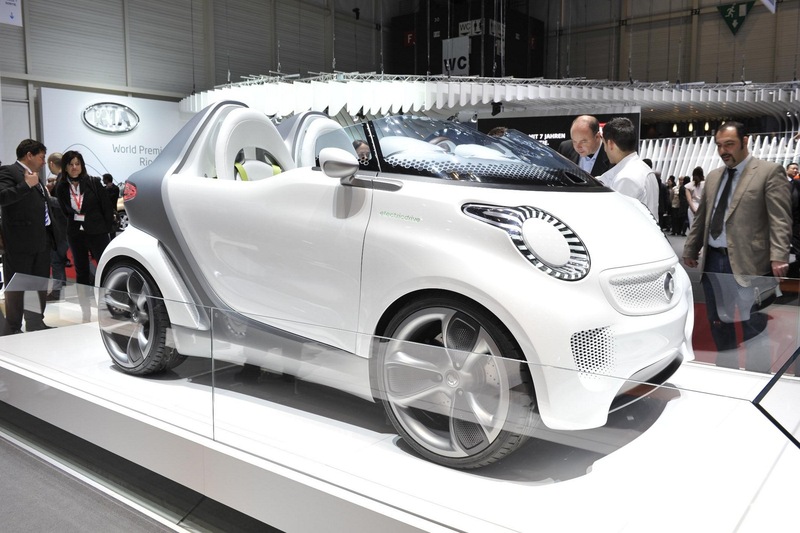 This is manifested in numerous details: the tridion safety cell flows from the outside behind the roll-over bars towards the front to the cockpit and forms the centre tunnel as a load-bearing part. 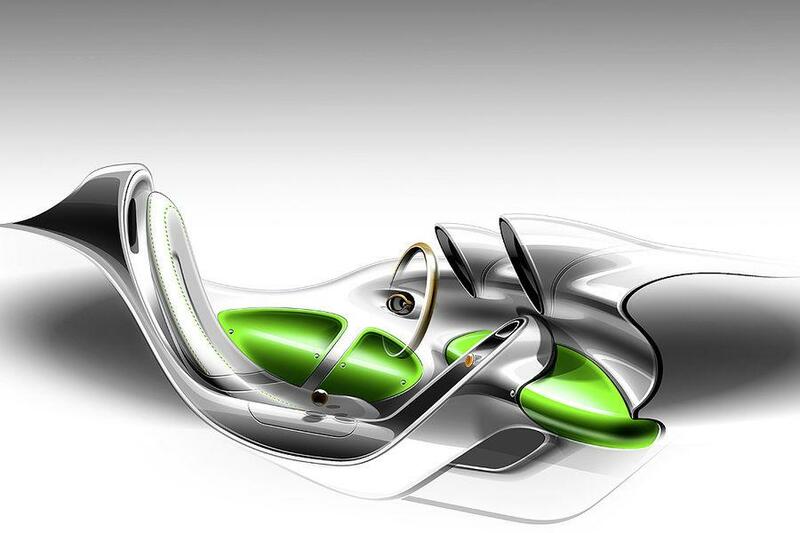 The outer and inner door sections connect seamlessly to form a single component, just like the floor and side walls. 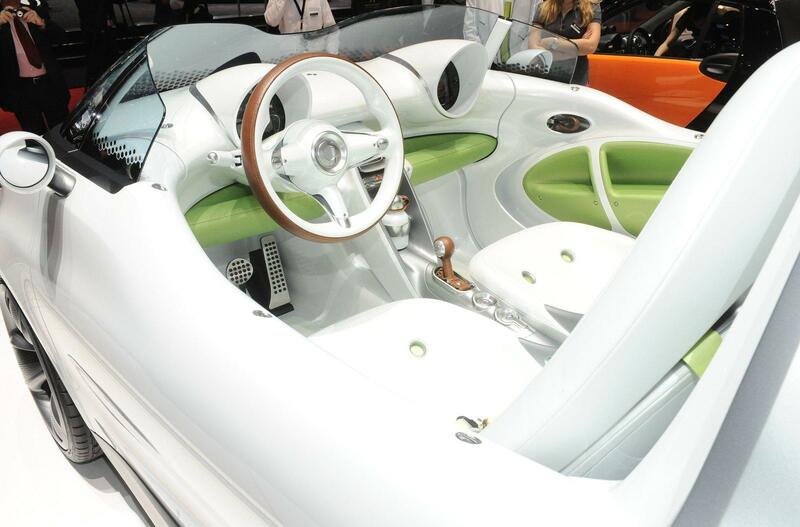 The leather seats also have a one-shell design and are a modern interpretation of purist sportiness. 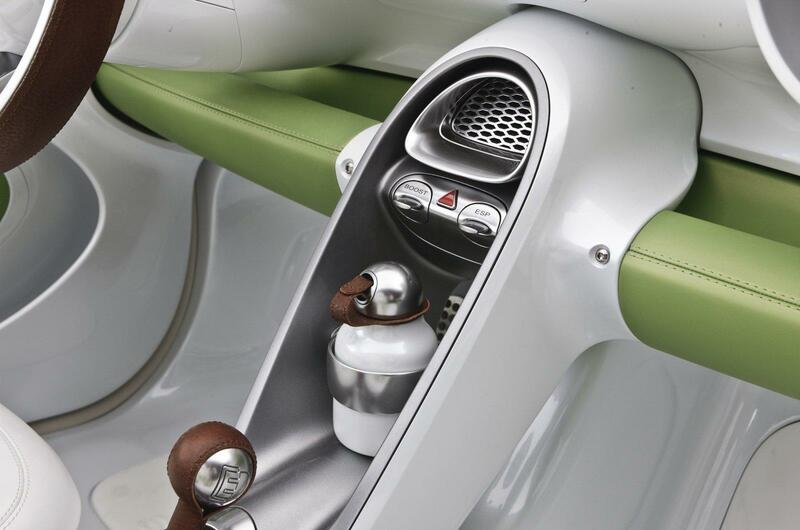 The air inlet in the wind deflector ends in the central outlet in the centre console and can provide even more fresh air for the interior when needed. 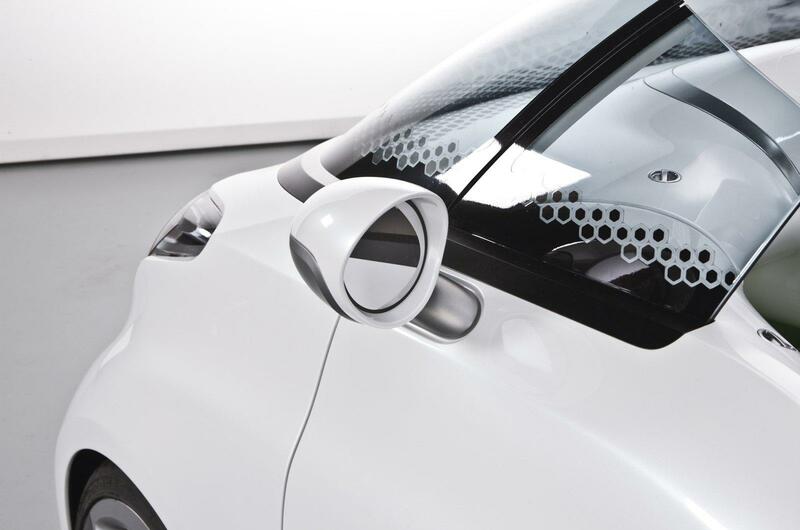 The high-gloss white of the exterior paintwork also dominates in the interior. 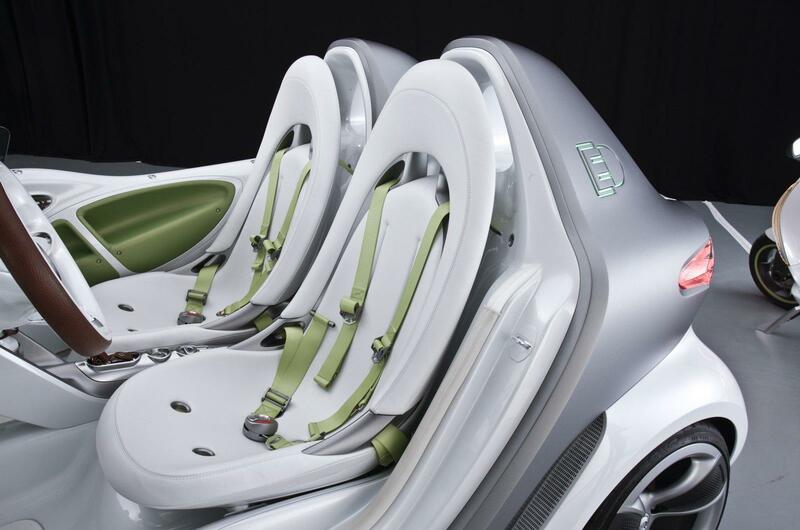 It is accentuated by green elements such as the sporty four-point seat belts for driver and passenger or the large horizontal shelf under the cockpit that provides stowage space. 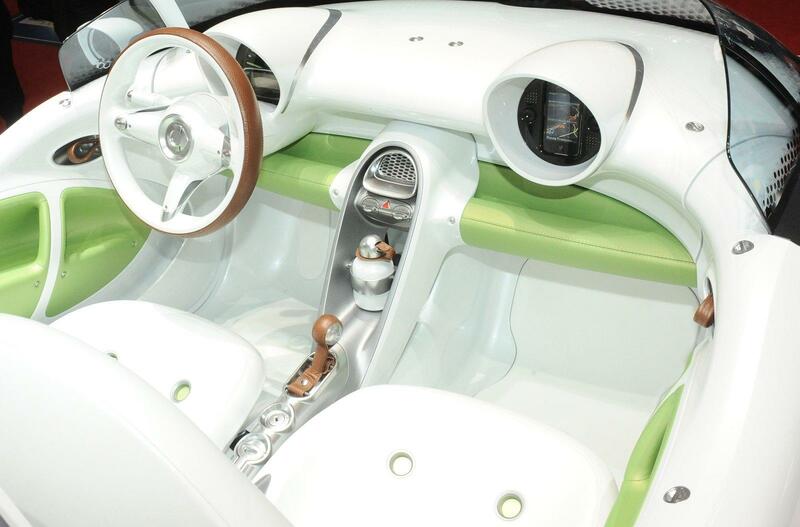 All the control elements that the driver uses particularly frequently, such as the gear lever, door openers or steering wheel come in natural brown leather. 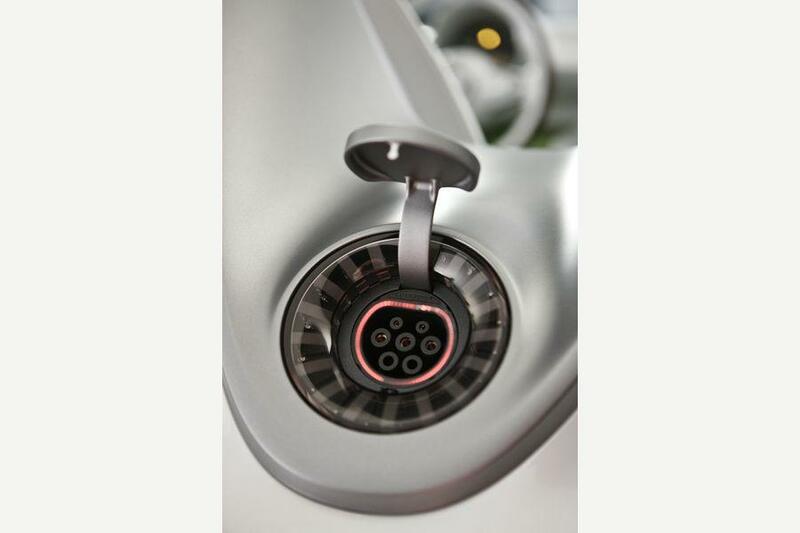 By contrast, load-bearing structural components such as the tridion safety cell or the curved trims on the instrument hoods are in matt platinum silver. 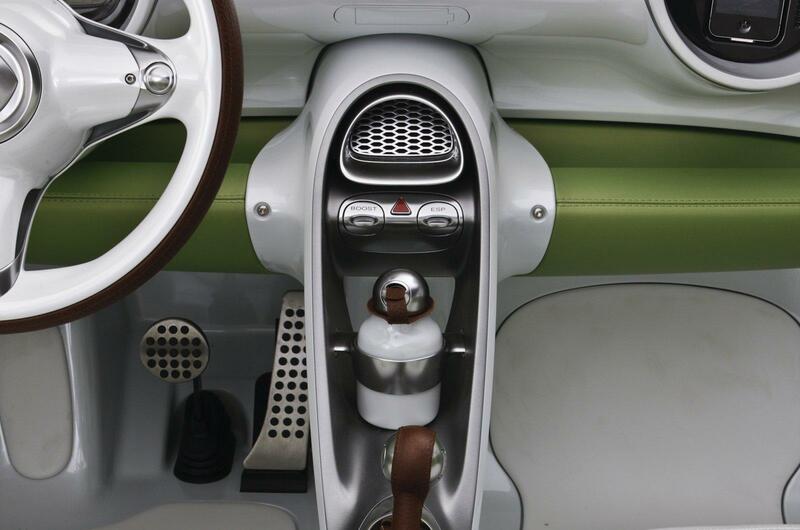 Functional elements such as the steering wheel buttons and the shift lever with gate are painted in silver shadow. 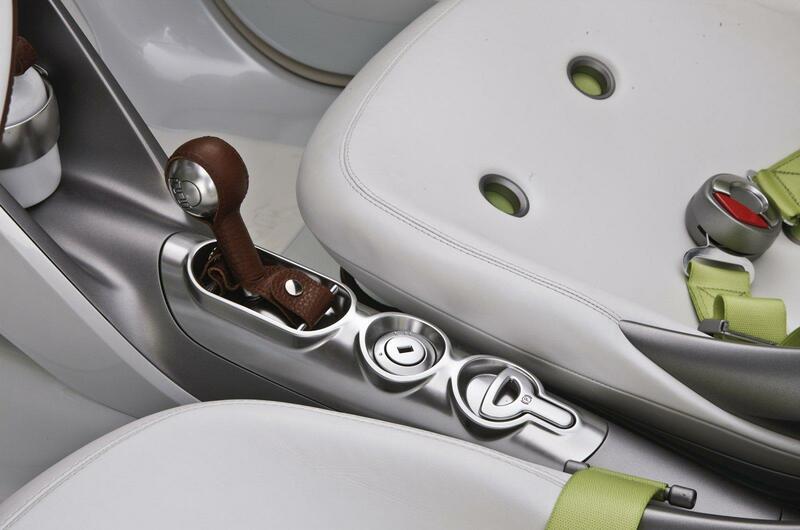 The open two-seater has been deliberately designed without an outer door handle – an interior grip is all that is needed to open the door. The control for the electric parking brake is particularly convenient to operate and also has a simple and functional design: the switch on the centre tunnel is reminiscent of the lever used to pull in the landing gear of aircraft. There is a block with ten LEDs in the middle of the instrument panel. 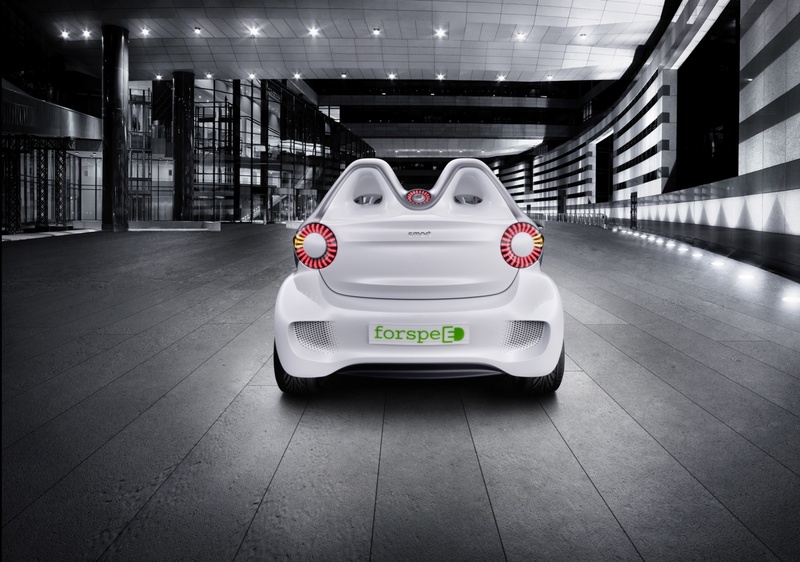 When the forspeed is started the LEDs shine through the translucent paint and show the battery charge status of the electric smart. When switched off noting is seen of the charge indicator except its outline. 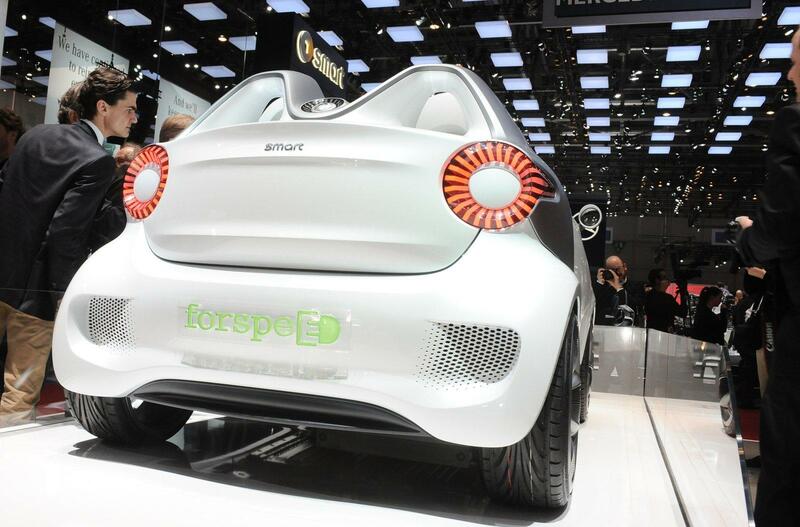 The whole interior of the smart forspeed can be protected against rain and sun when necessary with a tonneau cover. It is an easy matter to stretch it over the interior and fasten it to the body with the straps. 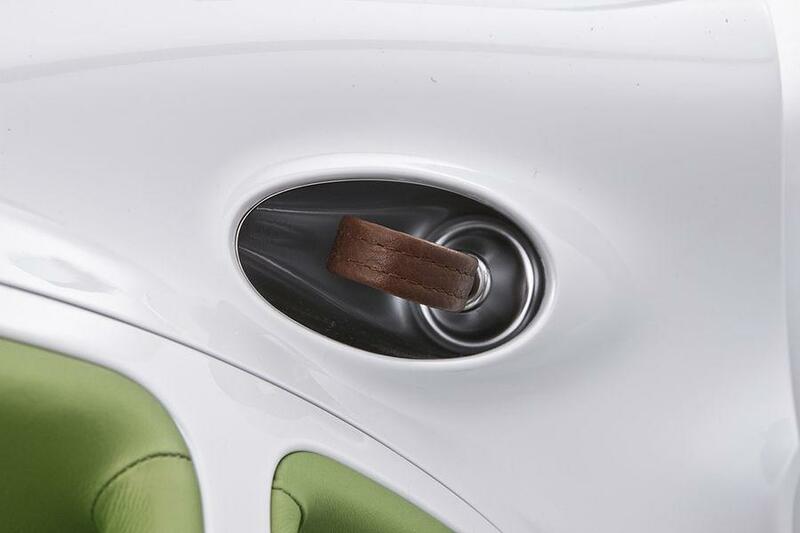 It can be divided in the middle with the help of a zip to free the driver’s seat only, for example. But even without weather protection a downpour will not lead to any serious problems. 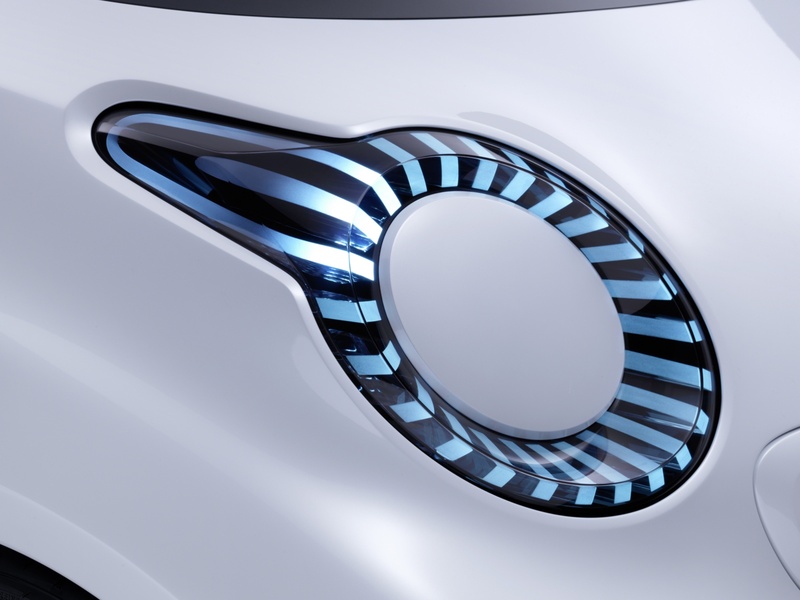 Water drainage channels in the vehicle floor ensure that water is channelled outside. 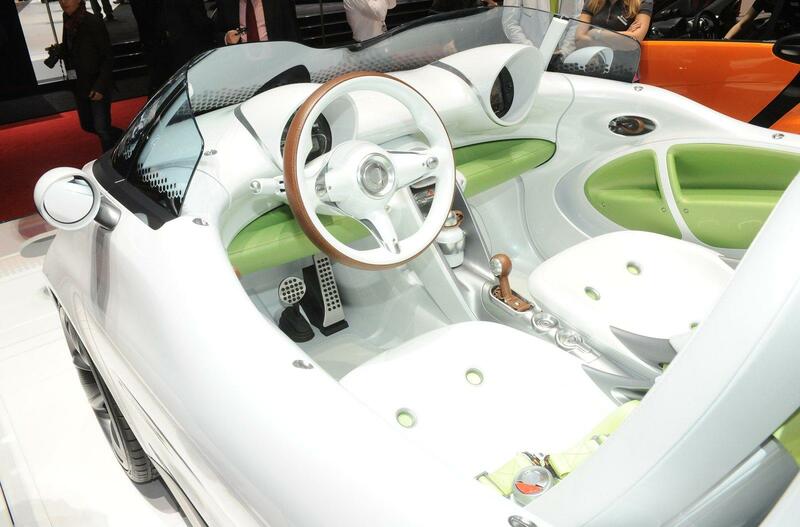 The seat surfaces also have water drainage channels and all interior equipment has a waterproof coating for fun behind the wheel regardless of the weather. 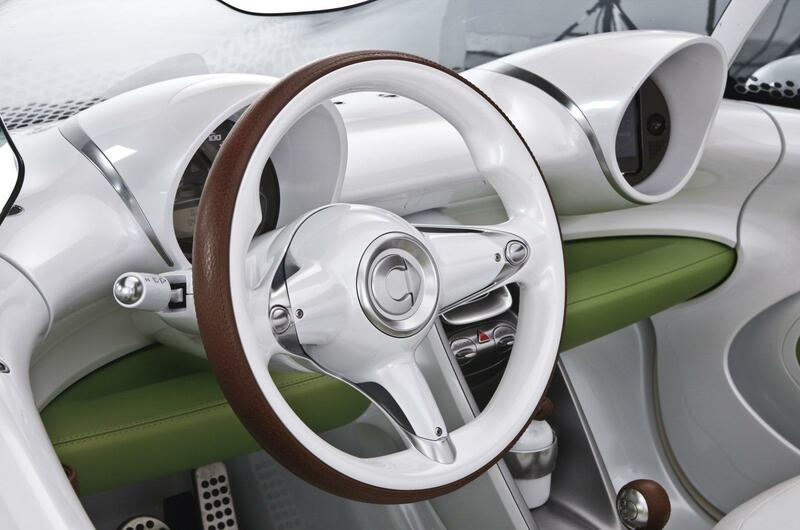 The purist sportiness of the interior is also reminiscent of classic aircraft construction: the driver and co-pilot sit in front of two separate round turbine-like instrument clusters. 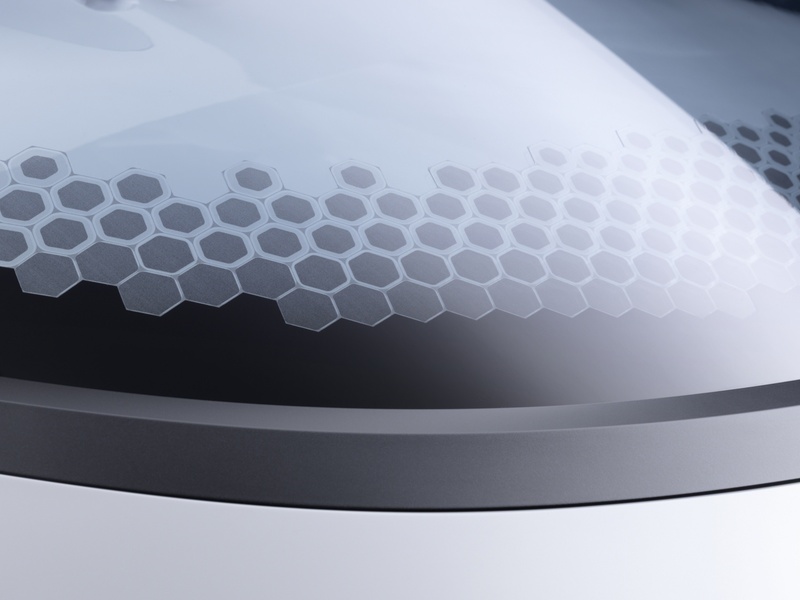 Whilst the driver has the speedometer firmly in his field of vision, the passenger is responsible for communication and navigation: this area of the cockpit features a smartphone. 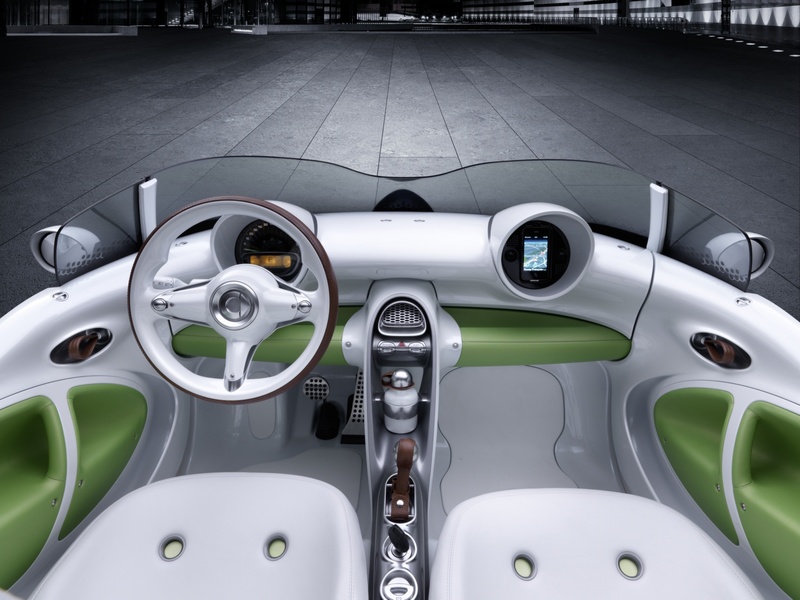 It can be swivelled by up to 90 degrees in its holder and towards the driver so that the driver can also take a look at the display of the navigation system. 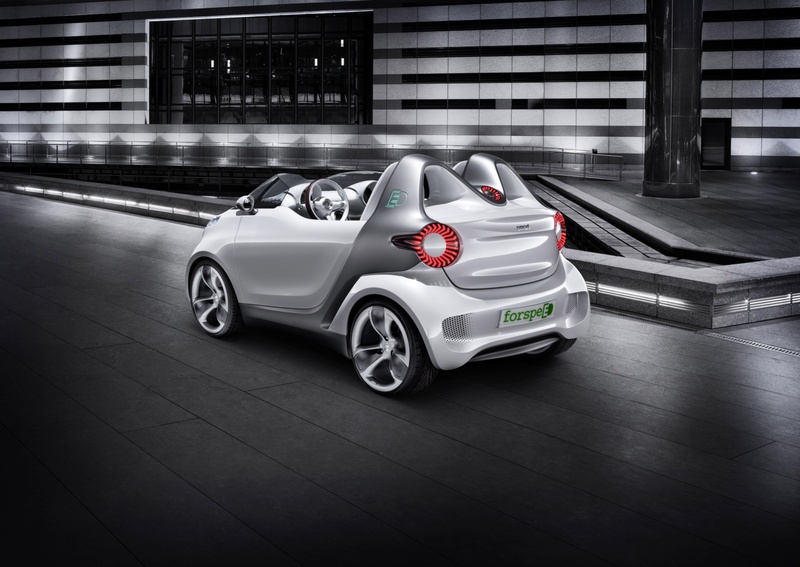 As in the production models from smart, the smart drive app for the iPhone® has all the important features needed whilst driving: phone calls via hands-free system, navigation with a special smart touch and a Car Finder that guides the driver back to the parked car. 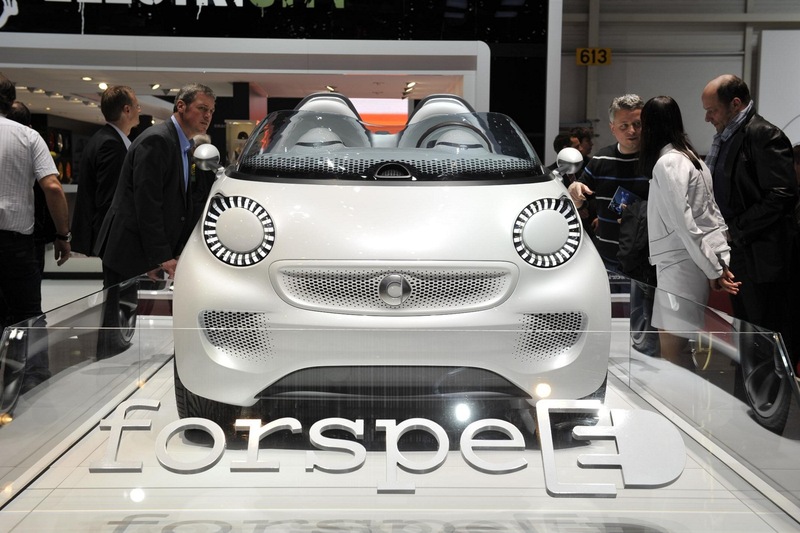 With its body made of glass fibre-reinforced plastic the smart forspeed is a real lightweight. 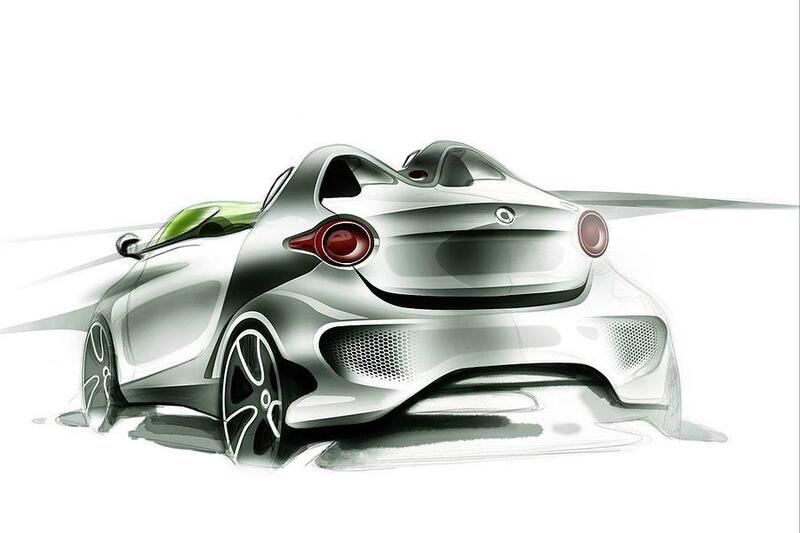 The low power-to-weight ratio is conducive to driving pleasure. 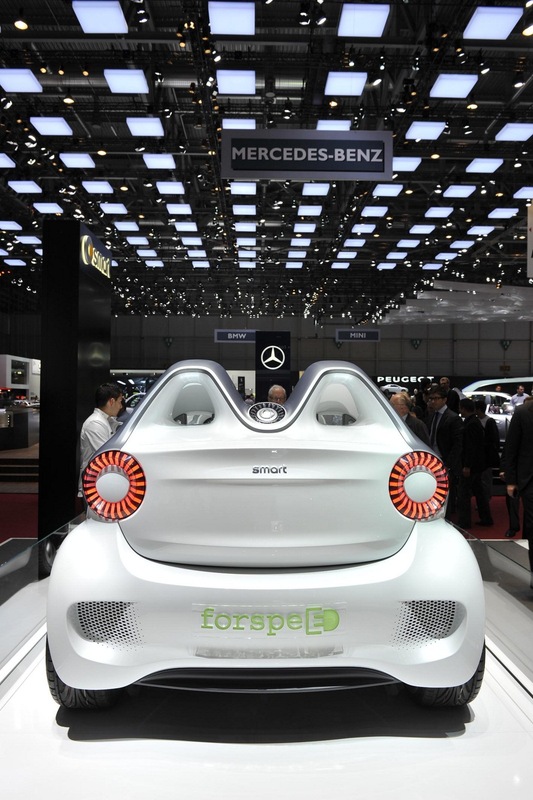 Moreover, the dynamic two-seater boasts excellent aerodynamics: round, taut forms, a deliberate lack of joints (for example on the single-piece front module), smooth, handleless surfaces on the doors and rear lid and the design of many details based on aircraft construction reduce aerodynamic resistance. 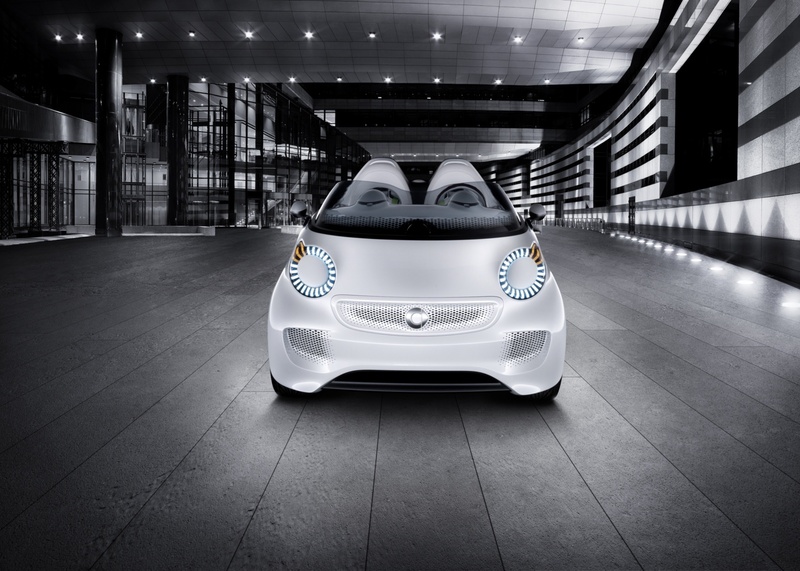 State-of-the-art LED lighting technology contributes to active safety. 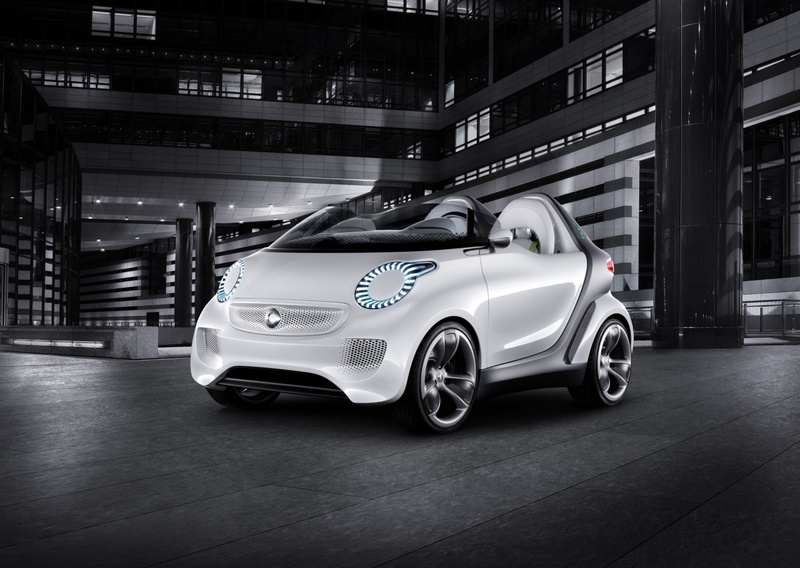 Furthermore, it is controlled intelligently: daytime running lamps are automatically activated during the daytime. 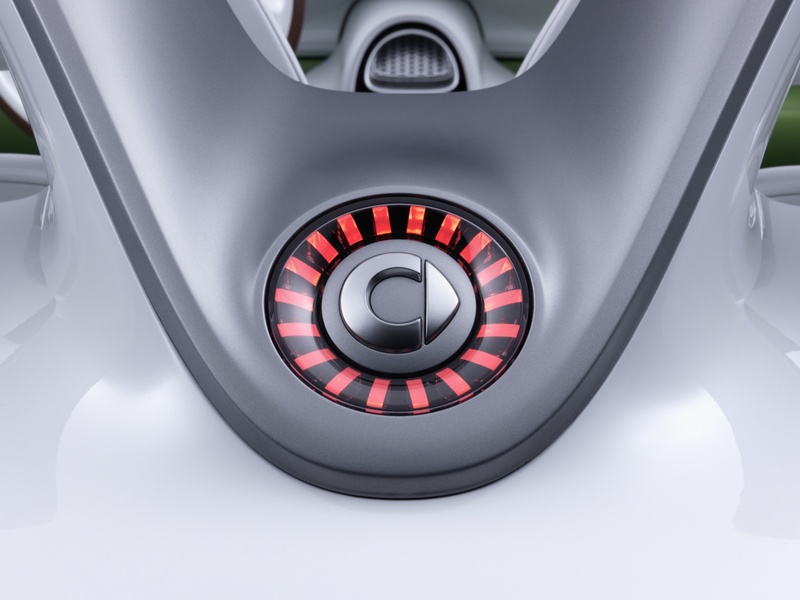 The Citylight system also senses when the forspeed driver turns night into day: photoelectric sensors monitor the brightness and give the command to automatically switch on the low-beam headlamps when necessary.